The French concept of terroir, a confluence of elements – soil, atmosphere, weather, and other factors – that gives something a certain taste or flavor to foods and wine, is often spoken of as an elusive concept outside of France. But it does exist in the United States, as well as other countries. We just don’t have a word for it. The French, being so good with words and language, and seemingly having a word for everything – of course, do. In France, each cheese and wine has a certain provenance that gives them specific characteristics. For example, you can’t make a Brie de Meaux outside of the Brie region, and Camembert de Normandie must come from Normandy. In the U.S., there are the merits of Texas pecans versus Arizona pecans to debate. Are Georgia peaches better than California peaches? And if you want to really get into it, one just needs to mention barbecue, and you know you’ve stepped into a minefield of tastes, and opinions. I was intrigued by Mulled Muscadines and Whipped Feta Toast, made with grapes indigenous to her region, a curious Pork Shoulder steak braised in red curry with Watermelon (which she says becomes similar to long-cooked tomatoes, which definitely makes me want to try that one out), and Dried Apple Chips, although I’m not sure how long a string of apple slices strung between two posts would last on a sidewalk in Paris. We’ve taken to planting nettles in our planter boxes, to thwart the rampant plant-pilfering. When I landed her recipe for a Party Magnet, a low-fallutin’ name for a cheese ball, I thought it’d be fun to give that one a go. I’m always looking for things to serve during the apéro hour, and also looking for ways to use up odd and ends of leftover cheese, like the French do with Fromage Fort. The recipes are written in everyday, folksy language, but without being cheesy. (Unlike the pun that I just used.) 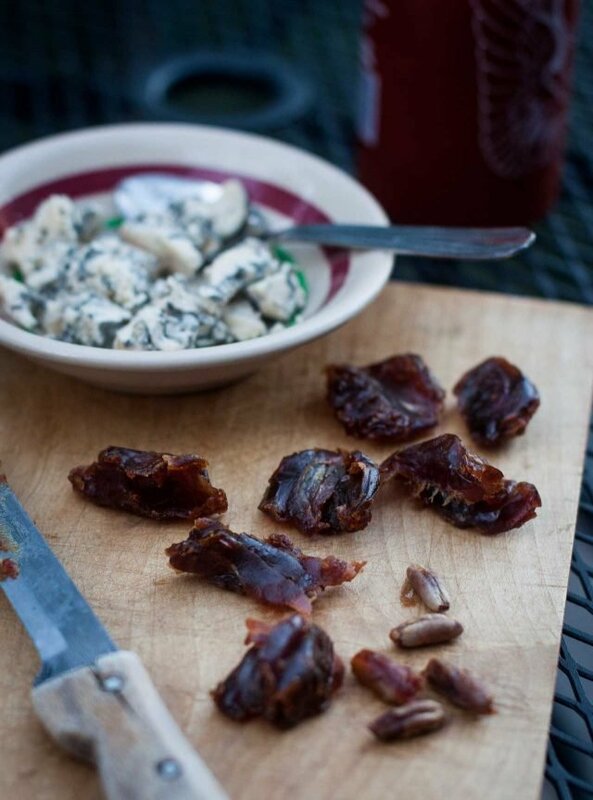 Vivian Howard talks in plain language about what to look out for in a recipe, such as not to use date “pieces,” which are dates mixed with flour, or not to flip out because the cheese mixture is too soft after you paddle it up in your stand mixer. Chilling the mixture will make it easy to shape into a ball. I felt well taken care of when reading through the instructions, and putting the boule de fromage together. But no matter how well-written a recipe is, there are some things you just can’t control. In this case, my camera died just as I was starting to put the cheese ball together. Going with the flow, I put the project on hold for a couple of days until it got out of the shop. So I can say for sure that for those of you into do-ahead projects, this cheese ball is one of them and can be made a few days in advance. Or, you can organize all the ingredients, and they’ll keep a few days until your camera gets out of the shop, in advance of sharing the recipe with friends. 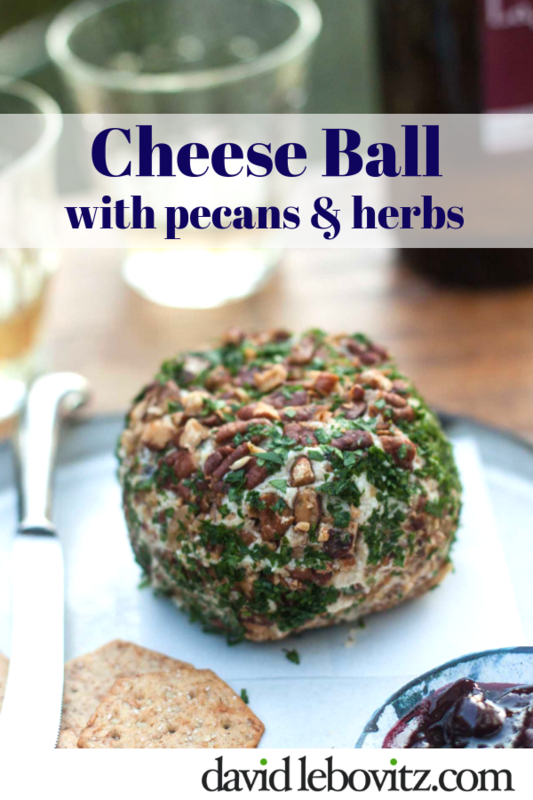 Adapted from Deep Run Roots by Vivian HowardYou can use any kind of dried fruit to mix into this cheese ball. I stuck with dates, but suspect that dried cranberries or cherries would give it a wintery, festive feel, if you serve it around the holidays. For the hot sauce, I used Mexican hot sauce, but Tabasco, Sriracha, harissa, or another favorite spicy condiment, would work.Cream cheese in France is called pâte à tartiner or fromage à tartiner (spreading paste or cheese), and can be found is grocery stores. If you can't find fresh goat cheese, feta would work. (Since feta can be quite salty, add salt to taste.) You won't need all the butter-roasted pecans, but leftovers are great as a snack, or tossed with salads or steamed green beans. 2. Add the chopped dates, scallions or chives, hot sauce, and salt to the bowl with the cheeses and butter. 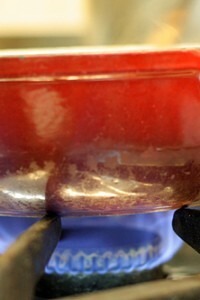 Attach the paddle attachment to the mixer and mix the ingredients until thoroughly combined. Taste, and add a bit more hot sauce if desired. Refrigerate the mixture until chilled enough to handle and shape, about 30 minutes or so. 3. Spread the chopped pecans on a dinner plate. 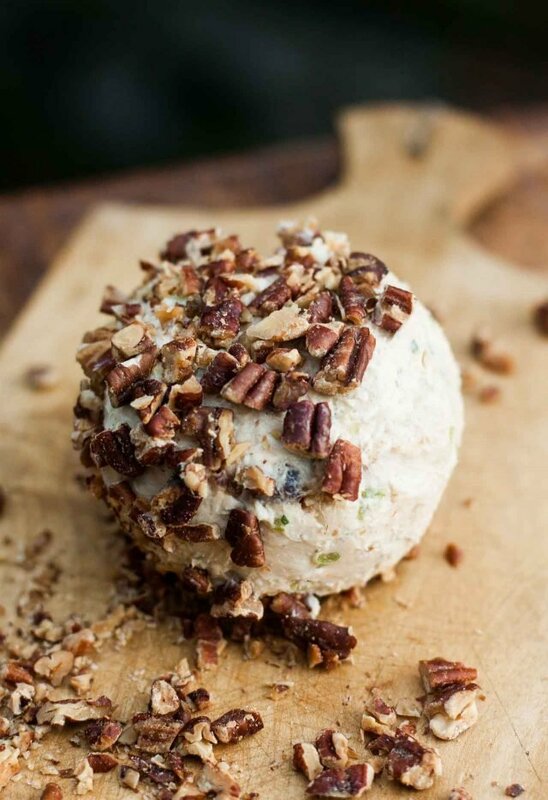 Shape the chilled cheese mixture into a ball and roll it in the pecans. 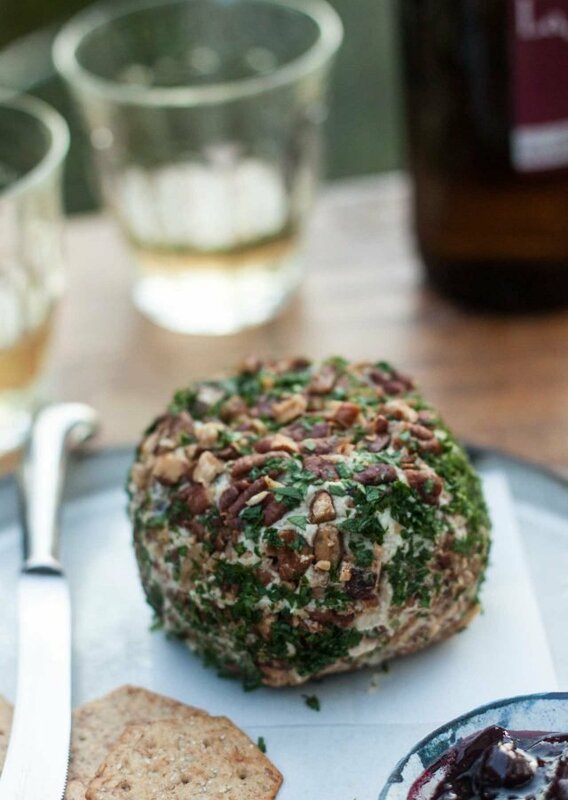 Spread the chopped parsley on the plate and roll the cheese ball in the parsley. Serving and storage: The cheese ball should be served at room temperature. It can be made a few days ahead and refrigerated until ready to serve. It's best served with plain crackers along with a favorite jam, such as cherry jam or apricot jam, or tangy chutney, such as fig chutney or green tomato-apple chutney. Vivian’s red curry pork shoulder with watermelon is amazing! The recipe is on A Chef’s Life website and I made it right after the show aired while watermelon was still in season. I had bought pork shoulder and watermelon yesterday so I made it. I used a pressure cooker and had honey apple cider vinegar. Tasted pretty good and the kids loved it. I would have preferred more spices. Next time. I used to think that I knew how to make a cheeseball, but I can see now that I haven’t been nearly purposeful or careful enough. This post reminds me that I need to slow down in the kitchen, and take as much pride in the process as I do in the final product. I think that a string of apples left out to dry would be covered with flies. Hmmm. 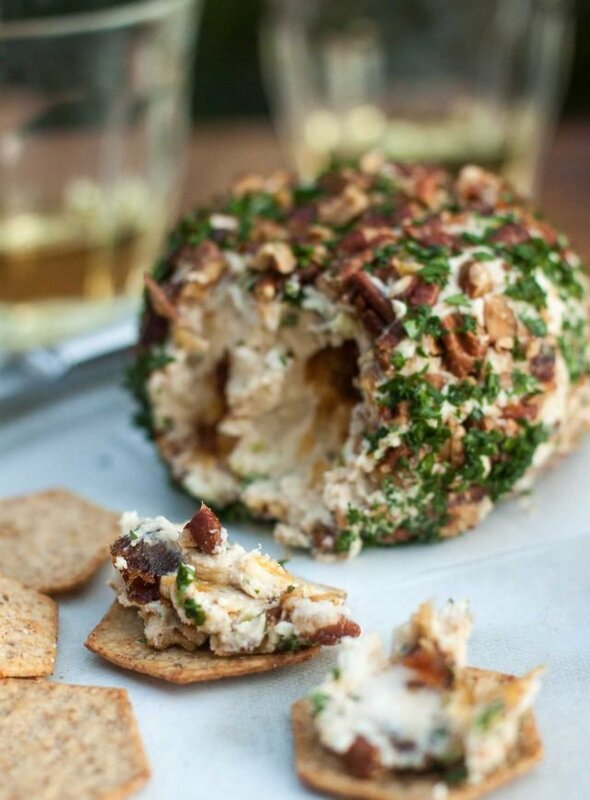 This cheese ball looks delish. I love the little rounds of chèvre that are covered with cranberries, cracked pepper, herbs or other things. I rarely see cheese for apéro though, except for those horrid individually packaged squares. The cheese ball would be a good thing to get going in France. I LOVE cheese balls, but would think they’d totally freak out French guests. Any suggestions to replace the dates? Thank you. In the headnote, I suggested dried cranberries or cherries, but apricots or figs (diced) would be nice as well. Yeah, I was just thinking apricots. Trader Joe’s has the best dried Blenheim apricots. I love them and I don’t even really like dried fruit. :) Also think your idea of cranberries or cherries would be wonderful! Never mind, I just read the WHOLE recipe. Sorry. Definitely making for the family Sinterklaas party in early December. The Dutch will love it! The recipe looks yummy and the presentation is lovely. I do not like blue cheese, do you have a suggestion for a substitute? 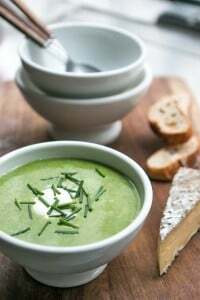 It depends on where you live (and what’s available) but something semi-soft, strong and pungent would work. I’d visit a local cheese shop, if you have one, to ask for suggestions – and tastes! Do you have a Trader Joe’s? Their Castello Bleu cheese is really good – softer and a bit milder than most blues. Actually, come to think of it, you might find Castello at other stores, too. Oh my, you have complete ruined my image of a cheese ball. I am pretty sure that after one taste of this globe-shaped goodness, Hickory Farms Cheese Balls will be removed my memory banks. Thank you! Thanks for all of your wonderful recipes! Your photos are scrumptous, too. Not to take away from your artistry, but what camera and lens do you use? Thank you for the print option. Much appreciated. David, you can get pecans in France? How about dried cranberries? I prefer Louisiana pecans, then Alabama, followed by Georgia. I just read that the “truffles” grown at the base of pecan trees are now a “chef” thing. For years farmers considered them a nuisance but now they’re an illusive sought after ingredient. The “truffles” have a pronounced pecan flavor rather than the truffle flavor. Which REALLY appeals to me! Just can’t acquire the taste for truffles! I bring my own pecans over from the U.S. because the ones you get in France, I find, aren’t usually all that fresh. We do get dried cranberries nowadays, although I’ve used dried barberries (available at stores that specialize in Iranian and Middle Eastern ingredients), to be a great replacement. Sounds and looks like a wonderful idea for a Thanksgiving appetizer. I will add it to my menu. One ingredient I find perplexing though is the butter added to the cheese mixture. Having other creamy buttery cheeses as ingredients it doesn’t seem necessary, unless to soften the bite of the blue cheese? I always thought the French would be terribly confused at the sight of a cheese ball haha. I especially appreciate your comments on terroir. I studied French at university and became so intrigued with the notion of terroir that I ended up writing my senior thesis about it. And now I love realizing the American terroir, which is something I was totally blind to until my early twenties. Lends to a deeper appreciation of food. So cool. Keep on! Replacing the dates with dried apricots and the pecans with pistachios would totally make this for me. As it stands I suspect it would be too sweet for my taste. I love pecans, but wow do I think pistachios would be great with this – adding a bit of salt. 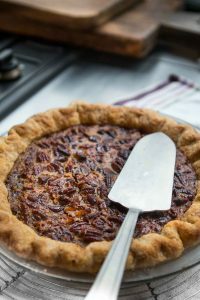 As for pecans, I think it would be amazing with Southern candied pecans – they’re addictive on their own anyway. Of course, LOL, that would certainly increase the sweetness, but also add the hint of cayenne to balance it, and the cream cheese out. Your directions call for 3/4 c. of pecans, 1/3 c. of which you direct to coarsely chop. However, there is no indication of what to do with the rest of the 3/4’s c. which are unchopped. Where are they included in the directions for this recipe? In the headnote of the recipe, I wrote “You won’t need all the butter-roasted pecans, but leftovers are great as a snack, or tossed with salads or steamed green beans.” It seemed like a good idea to do a few more, rather than just the 1/3 cup called for in the recipe. We came across a vendor @ a Saturday market in the Loire valley that sold goat cheese balls covered with a variety of toppings, both savory & sweet. We chose one with chopped fresh tarragon, garlic and cracked pepper. Part of an impromptu lunch on the banks of the river Cher on a crisp autumn day. Delicious. A real “foodie” take on the humble cheese ball – I will be using your recipe during the holidays. My mom always concocted some wonderfully crafted ones with leftover cheeses, hot sauce, caraway or horseradish or a drop or two of worcestershire and assorted combinations from her panoply of condiments, spices and herbs. They were always spicy, a little sharp, and very popular with our guests in the 50’s and 60’s. Purchased ones always tasted so artificial and lackluster compared to the ones she created. This recipe takes me back 60 years, at least! Thanks for bringing them back to us. J’adore. I love this so much. You never cease to amaze us. I’m slightly nervous that this will be *too* good, but I’m going to give it a try anyway! Only one problem – you use a phrase I’m not familiar with: “leftover cheese”. Cheese that…hasn’t been eaten? Surely that can’t be right. That would never happen. Whatever you give to us is wonderful. cheese ball next month! Thank you! Back on topic, cheese balls rock. This reminds me to make it for pre-Thanksgiving dinner noshing. Which is the best part of the meal, IMO. What wine is pictured in the background? I’ve had it but don’t remember the name. Thanks! Look delicious. I knew there’s a better way to make a cheeseball and this is it! I also love that there’s a print version. This would be a wonderful appetizer. Think I’d rather have Fromage Fort any day. Two entirely different concepts tho..I’m just not that into sweet cheeses. Thanks for the link to FF. This looks like the Cadillac of Southern cheeseballs. I’m not crazy about goat cheese, so is there anything you could recommend as a substitute for that component? Would Queso Fresco work? Thank you for the recipe for the butter roasted pecans. I have been a long time fan of Young Plantation’s version from Florence, South Carolina. Can’t wait to compare- and make the cheeseball this holiday season! This look divine, will do that when my parents come for visit but with slivered almonds instead of pecans because you cannot really get the latter here in a good quality. Also, from the pictures I first thought the middle of the cheeseball was liquid and got all excited :D Still great! Nut allergy here….I wonder if you have a suggestion. For a replacement?? Sure, pumpkin seeds would work. 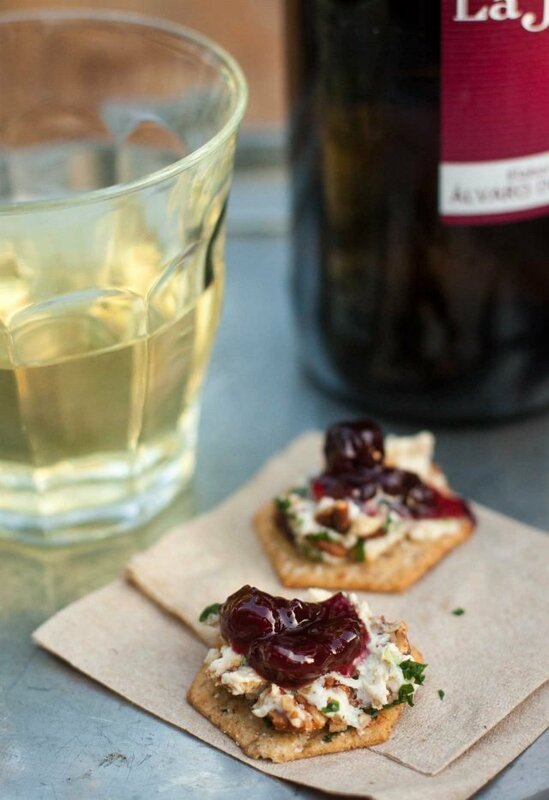 I´m always looking for little treats to serve during the apéro hour, too, so this recipe is just what I need. The perfect addition to the usual gougères. Again such a wonderful post, David! PS: may I add I just linked back to one of your older posts from 2008 (grape sherbet), but couldn´t leave a note there, so I´m doing it here. Hope you´re ok with that! I think I will have rose-hip jam with it (seems to be the latest fad in Canada). What kind of dates did you use? Do you think the crackers are something we can get in the States? Congratulations on the Print Icon that now shows up on the recipes! Sorry if I’m late thanking you for this wonderful feature. Good Job!